If you are snack-motivated, dips are more than just a party food — dips are a lifestyle. 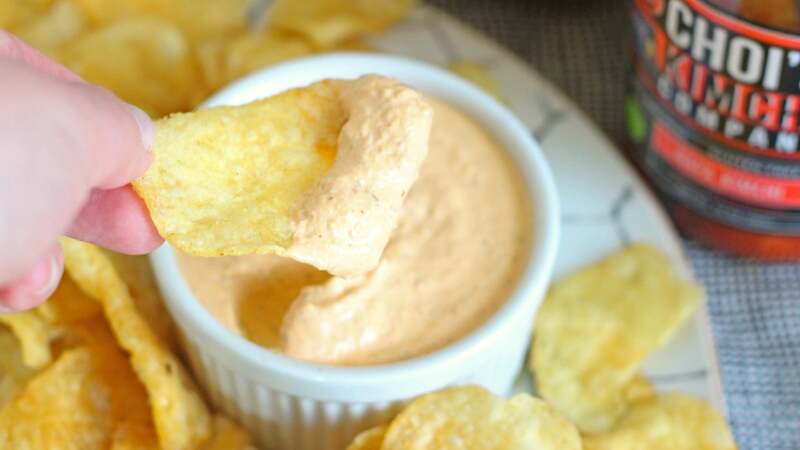 Dipping something salty and crunchy into something creamy is a sensory experience so delightful, I have been known to eat an entire dinner of chips and dip. Onion dip is a favourite, but it takes a bit of time to do it properly, so I like to have a few other "recipes" I can whip up to satisfy my dip craving. Honestly, there is nothing wrong with dipping a flavoured potato chip into plain sour cream — kind of like a reverse dip — but there are a few pantry items you can use to make flavorful, easy, two-ingredient dips. This fermented, spicy, cabbage provides so much flavour, there's no reason to add any additional seasoning. This dip requires the most "work," meaning you have to break out some sort of food-processing device, but the resulting snack is worth cleaning the food processor for. For every half cup of sour cream, add 80g of your favourite kimchi. Pulse to your desired level of smoothness, and pop it in the fridge to chill for about 15 minutes. The darker the miso, the better your dip will be. I like this dark aged miso, which has an aggressive amount of umami, so you don't need a ton of it. One and a half teaspoons is plenty for a half cup of sour cream, but you may need a little more if you're using a milder miso. Just add a little bit at a time, stir it with a spoon, taste with a tester chip, and add more if needed. Curry paste is another taste-packed pantry item that does well swirled into a creamy flavour carrier. I'm a big fan of lemongrass, ginger, and chilli-packed red curry paste, but feel free to branch out into other styles and flavours. One tablespoon stirred into half a cup of sour cream makes for an aromatic chip dipper. Of course, you could add more ingredients if you want to, but I have never found that to be needed. If you need a garnish, a sprinkling of chives or green onion can elevate the plate, but considering how quickly I shovel these dips into my mouth, I've never been particularly concerned with presentation.